Lately, there have been a lot of writers crying the blues about their books – “I’m promoting like mad, but no one is downloading my book,” or “I can’t get any reviews,” or “Someone gave me a bad one-star review.” Oh, gee, I say as I search for it on the interwebz, I’m so sorry. My books are selling, but 1. I promote judiciously and 2. I follow the standard maxim – Nothing sells Book One like Book Two. And while I’ve garnered my share of good reviews, I’ve gotten my share of bad ones, too. Okay, now I remember, you were the one who said, I don’t need no stinking cover artist, I can make my own. Um. Oh, darlin’, bless your heart, yes you did and yes you do. Or you said, I don’t have a lot of money, and listened to those folks who suggested that you create your own. Unless you’re an artist or a graphic artist, you really should get a professional. Now I say this as someone who did make their own cover – and even won an award for it – but I was a portrait artist once. Even so, I found I wasn’t getting the readers I wanted. So, I saved until I could afford a professional – and it made an astonishing difference in sales and reviews. If money is tight, try using a pre-made cover by a good cover artist. You might find the perfect one, or you might find one that will do for now. There’s nothing that screams amateur more than a bad cover. And I’ve seen some truly bad ones. Most writers are truly awful cover artists. That might be one reason folks aren’t downloading your book. You do have reviews – most of which are astonishingly complimentary. “Great book” “Best I’ve read in a long time.” So, why isn’t your book doing better? It’s that one bad review, though, that raises eyebrows. “The editing is terrible.” Well. we all get those now and then, sometimes in phone-text speech (badly spelled, which makes the review even more questionable), or debating the placement of commas. Then I look at the book sample provided. You also said that you didn’t think you needed an editor, and it shows. Even editors will admit that they need editors. There are books that can help – The Elements of Style will help you correct the most common errors. Go to your local high school or university, see if one of the instructors would be willing to do a line edit (corrections for grammar) for you. Then find an editor who specializes in your type of writing. Find several. Ask if they’re available, send them a sample chapter, and save your money. Whether self-published, hybrid or traditionally published, you first owe your readers the best quality writing you can do. You owe the same to every other indie, self-published writer struggling to be taken seriously as well. Don’t tarnish yourself or others with less than your best. 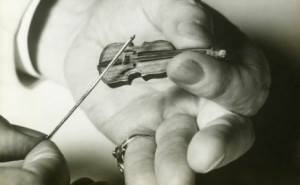 Don’t make me pull out my teeny, tiny violin if you didn’t. Previous story What to write. For writers and the like.